The title song from Chapter 5: Kool & the Gang's "Summer Madness" was the B side to "Spirit of the Boogie," a number 1 R&B and top 40 pop single from the summer of 1975. 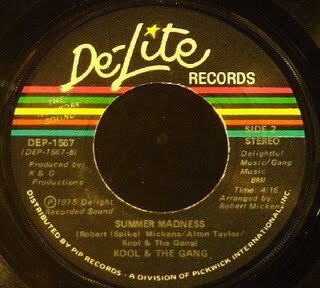 "Summer Madness" is an often-sampled classic and a favorite of mine. 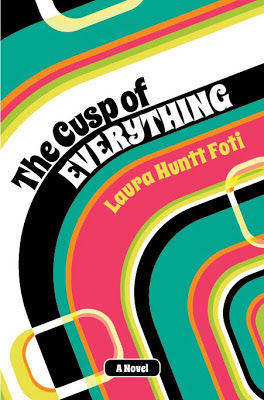 In Cusp, it's what's on the radio Karen turns on in her car after an episode with her younger sister Ruth that puts her in a foul mood. Not up for the song's mellow tones, she quickly changes the station and rejects another song (check back tomorrow) before settling on a third that finally fits her attitude. Gary Glitter's "Rock And Roll Part 2" (OK, it does have a few "heys" and chants, but no real lyrics) was a top 10 hit in 1972. "Frankenstein" by the Edgar Winter Group hit number 1 and "Hocus Pocus" by the Dutch group Focus number 9 in 1973. "Soul Makossa" by Manu Dibango (later an integral part of Michael Jackson's "Wanna Be Startin' Something" and many other songs) also came out in 1973. "Love's Theme" by the Love Unlimited Orchestra (written by Barry White) was number 1 in 1974. AWB's "Pick Up the Pieces" was ubiquitous in 1975, as was Van McCoy's "The Hustle." Both were number 1 hits. "Feels So Good" by Chuck Mangione, featuring my friend and guitarist extraordinaire Grant Geissman, went to number 4 in 1978. Instrumental movie themes were frequent hits. Examples include "Also Sprach Zarathustra" (from 2001: A Space Odyssey) by Deodato and "Dueling Banjos" (from Deliverance) in 1973, "Tubular Bells" from The Exorcist in '74, "Gonna Fly Now" from Rocky and two versions of the Star Wars theme in 1977. What was your favorite instrumental hit?